And how do things usually work out for the rat? There are ample warning signs that another serious financial crisis is on the way. These warning signs are being soundly ignored by the majority, though. Perhaps understandably so. After 10 years of near-constant central bank interventions to prop up markets and make stocks, bonds and real estate rise in price -- while also simultaneously hammering commodities to mask the inflationary impact of their money printing from the masses -- it’s difficult to imagine that “they” will allow markets to ever fall again. This is known as the “central bank put”: whenever the markets begin to teeter, the central banks will step in to prop/nudge/cajole the markets back towards the “correct” direction, which is always: Up! It’s easy in retrospect to see how the central banks have become caught in this trap of their own making, where they're now responsible for supporting all the markets all the time. The 2008 crisis really spooked them. Hence their massive money printing spree to "rescue" the system. But instead of admitting that Great Financial Crisis was the logical result of flawed policies implemented after the 2000 Dot-Com crash (which, in turn, was the result of flawed policies pursued in the 1990’s), the central banks decided after 2008 to double down on their bets -- implementing even worse policies. This global flood of freshly-printed 'thin air' money has no parallel in the historical records. All around the world, each of us is part of a grand experiment being conducted without the benefits of either prior experience or controls. Its outcome will be binary: either super-great or spectacularly awful. If the former, then no worries. We'll just continue to borrow and spend in ever-greater amounts -- forever. Perpetual prosperity for everyone! But if things hit a breaking point, then you had better be prepared for some truly bad times. Excessive money printing leads to the destruction of currency. Fiat money (like the US dollar, the Euro, the Yen, and every other world currency) is a social contract and has an associated set of related agreements. When that contract and those agreements are broken by reckless expansion of the currency base, things fall apart fast. We need look no further than current-day Venezuela to understand that. It’s important to remember that money -- whether physical cash or in digital form, stocks, or bonds -- is just a claim on real wealth. Real wealth is land, clothes, food, oil…you know, real things. We expect that our cash will be able to buy us the real things we want when we want them. We trust that our stocks give us an ownership stake in a real company producing real things for real profits. We rely on our bonds being re-paid in the future along with interest; but if not, we expect that our bond becomes a claim on valuable collateral. Ideally, the money supply and the amount of real wealth should exist in balance. As money is a claim on "stuff", as economic output (i.e. "stuff") increases, then so should the claims. And vice-versa during periods of economic contraction. But what happens when the claims start to far outweigh the real "stuff"? That's when things get precarious. The flood of money unleashed by QE didn't result in vast amounts of new actual wealth being created (i.e. greater productive output per capita). But it did result in grotesquely-inflated financial asset prices that have helped to create the most profound wealth and income inequality seen in our lifetime (perhaps ever). The list of central bank-induced injustices is long. It reads like the rap sheet of a virulent psychopath: $trillions looted from savers and handed to the big banks and leveraged speculators, ruined pensions, shattered retirement dreams for millions, record amounts of debt in every corner of the global economy, and an increasingly unaffordable cost of living for everyone but the elite 1%. “But we had to save the system!” cry the central bankers in their defense. Even if that were the case (and I dispute whether the world is really better off for having saved Citibank et al. ), that rescue should have ended back in mid-2009, at the latest. The bigger the printing spree the bigger the fundamental distortions. In such a world, up becomes down, black becomes white, and right becomes wrong. All of which means that fundamental analysis, has been all but useless as a predictor of prices. 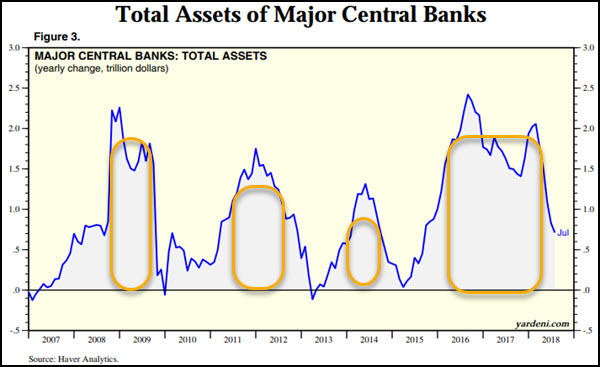 All that has mattered is the answer to the question: "How much will the central banks print next?" In such an environment, there's no room for investors. It forces all of us to become speculators, trying to predict what a small cabal of bankers are thinking. But among their very worst offenses has been the manipulation of sentiment. The prices of financial assets and commodities have become political and propaganda tools, which means that nothing can be left to chance. All prices have to send the "right" signals at all times, in the same way that certain news outlets pump a point of view endlessly. Repetition creates its own reality. Because of the increasingly frequent (probably daily), interventions by central banks and their proxies, the financial markets have become ““markets””. They no longer provide us with any useful signals about the future or about the current health of the economy. Instead, they only tell us what the authorities want us to hear. To them, all that matters is strength and stability. As long as those conditions contine to be met for stocks, bonds and real estate prices, most people are content to let things ride and not probe too deeply. But when this scam comes to its inevitable end, the crash will be spectacular when it arrives. This reckoning is already way overdue. At this point, we find ourselves in the odd position of rooting for it to happen soon, as the potential energy in the system builds with every passing day. Our worry is that if the crash is delayed for much longer, its resulting carnage will be so large that it will be unsurvivable. And while we mean that in the figurative sense for people’s portfolios, it's possible that the crash could become literally unsurvivable if the political “solution” to deflect blame away from the the central banks and their DC partners-in-crime is a kinetic war. When viewed in that light, America's histrionic attempts to demonize Russia over the past few years begin to make frighteningly more sense. We've been vocal of late about the numerous signs that another great financial crisis is building. The gut-punch Turkey hit global markets with this week is just one example. Yes, it will be painful to crash from here. But once the needed correction is underway, we'll have the opportunity to make the best of it. We can pick up the pieces and begin building towards a future we can all believe in. Yes, there's no avoiding the pain of taking our lumps for the the past mistakes we've made. But we don’t have to compound our misery by continuing to do more of exactly what got us into this mess in the first place. We simply need the courage to face the psychological burden of admitting to our prior failings. It all starts with being honest with ourselves. Look, we all know the world is finite. Infinite economic growth on a finite planet is an impossibility. We have all the data we need to make that conclusion. Every passing day where we pretend that’s somehow untrue or avoidable makes the eventual adjustment that much more wrenching. It’s an intellectually simple exercise to conduct. But an emotionally impossible task for those whose internal belief systems would be hopelessly compromised by allowing that logic to penetrate their world view. And so the future will be represented by two sorts of people: those able to face what’s coming head on and prepare accordingly, and those who can't. I sincerely hope that you're not among those deterred from preparing by the last gleaming of today's glittering stock prices. We’re going to need as many prepared people as possible in the coming future. And we may need them soon. The severe recent deterioration in the Emerging Markets threatens a contagion that could well start the next crisis. Turkey is currently in a major currency crisis threatening to metastisize into a full-blown sovereign debt crisis. Defaults there will spill over into Europe’s banking system (which has made loads of shaky loans to Turkey), and from there cause domino effects throughout the rest of the world. But Turkey isn't the weakest or the most worrying country faltering: Italy is stumbling, as is Brazil, and even China. But Asia ex-China is the real powderkeg. Their unserviceable debts dwarf everybody else. In Part 2: The Emerging Market Threat, we detail out the specific concerns to watch for in the fast-unfolding Emerging Markets drama. Which countries pose the greatest threat? And how bad could things get if the contagion indeed spreads? For years we have predicted that the next crisis will progress "from the outside in" as the weaker players succumb first. That appears to be what we are seeing now, and it's causing me to advance my own personal preparations. Infinite growth on a finite planet is not possible, as any sane person would agree. In fact it is worse than this. Most of the resources that our current lifesyle takes for granted are non-renewable on a human timescale like fossil energy and fresh water aquifer reserves. Hence one would expect global GDP to follow a bell shaped curve (Standard run on the World One model from Limits to Growth 1972). We would be on the downward slope of this curve without central bank intervention. By flooding the world economy with liquidity we have brought future GDP forward in time. Borrowed GDP from the future to maintain current GDP levels. In effect flattened the peak of the bell shaped curve. Mathematically one cannot do this for ever because it takes exponentially increasing liquidity to maintain this plateau until something unforeseen breaks, as it must eventually do, a Minsky moment, at which point we fall off the cliff - called the Seneca cliff. Who knows how long Central Banks can mantain control ? I expect QE5 the moment GDP goes down again, because we are well beyond the point where a soft landing can be engineered. This will dwarf all the QEs that have gone before it and give us another few years of extend and pretend. We could be living through the very last and biggest bull market in human history. Live life now, folks. Enjoy your health and get all your life's ambitions done NOW..
Infinite growth and complex systems. Yes, infinite growth on a finite planet what could possibly go wrong? There are groups of humans (especially our 'decision-makers') who believe they can control and regulate complex systems. Unfortunately, they have been somewhat emboldened by their short term 'success', ignoring (burying?) the longer term consequences. Limits to growth. Diminishing marginal utlity. Peak resources. Environmental degradation. The list goes on and seems to grow with each passing year. And when you lose control you'll reap the harvest you have sown. And as the fear grows the bad blood slows and turns to stone. So have a good drown as you go down all alone. 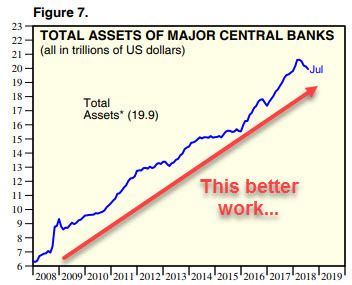 John Rubino posted at ZH an article that explains "for Dummies" (like me) what happens when an institution located in and doing business in an emerging market (like Brazil or Turkey) takes out a loan in Dollars. Then the value of the Dollar RISES relative the to currency in which they are doing business. Though the payments are stable (in dollars), the number of Lira needed to make each payment rises. This is crippling for the business. I'm not sure this is really as uncontrolled as it appears. These "outside" countries are all part of the same western central banking system so if they really posed such a threat of contagion you can be sure the international printing presses would be coming to the rescue. If they truly were "outsiders" you can be sure they would be being demonized -- think Iran and N Korea. Possibly Russia. To put on my conspiracy theorist hat, there were ample clues to the date of 9/11 that were only discovered by people afterwards. Google it and you'll find tons. Similarly I find the timing of the 2008 crash and the numbers associated with it to be too coincidental to be left to chance. PM commentators seem to be suggesting that the setup now is more bullish than it has been in many years, and if Ted Butler's recent numbers are correct, JP Morgan may now hold 1/3 of the world's above ground silver. Their Hunt Brothers moment may be at hand. One thing that makes it probable is that there was three times the amount of silver above ground in 1980 than there is today. The six billion ounces that existed in 1980 has shrunk to two billion ounces of industry standard 1000 ounces bars... I understand that many doubt my claims that JPMorgan has amassed 750 million ounces of physical silver and 20 million ounces of gold. After all, aside from the near 150 million documentable ounces of silver that JPMorgan holds in its own COMEX warehouse proof of the other 600 million ounces that JPM owns is notably missing. Certainly, if the entire 750 million ounces could be seen by everyone, there would be no debate. It is precisely because most of the silver held by JPMorgan can't be seen that makes my claim noteworthy. I am now predicting October 2018 will be the crash, because it was predicted on The Economist in 1988. What does 10 mean? It's odd, just sitting there without explanation. Does10 = October? Maybe I will be wrong, I've been wrong before. If I'm right I'll try not to gloat about it but I'm sure I will... if I'm wrong I will admmit it. I guess if one's constantly warning of imminent collapse, eventually you'll be right. "crash could become literally unsurvivable if the political “solution” to deflect blame away from the the central banks and their DC partners-in-crime is a kinetic war." History is replete with examples of this very thing. Regan did it, Bush did it, Clinton did it, W did it. Obama inherited multiple wars and just kept flogging them. The odds of Trump starting another to distract from a decline in economic performance are very high. As demonstrated by his attacks on Syria, when it happens the press will uniformly claim he's being "Presidential". I'd tend to agree with you about central banks being in collusion. And I also agree that an October 2018 crash seems to be a logical timing. My reason for the timing, is the interest rate rises will be just about ready to take down the market in a month or two.. The low interest rates were part of the Central Bank Put. Now that's off the table. Why? because of what yu said about the central banks being in collusion. And the underlying reason they are likely in collusion, is there will be a "bailout" to keep the system liquid, after a crash. But it won't be by printing more dollars that already are in such excess, and with their lost trust. It will likely be by the IMF's global currency. Then the crash makes sense, as a way of ushering in a world currency. Just like the Economist said that you posted. 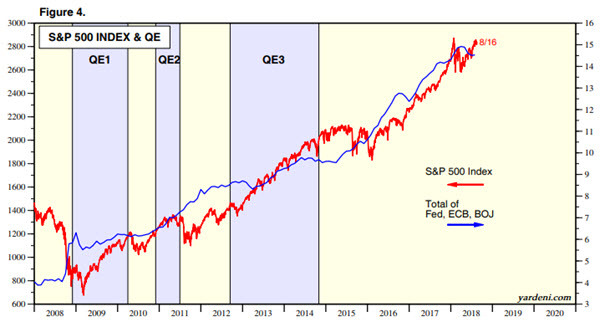 So no more QE, people! No more PUT. Just a failing economy with a crashed stock market. And no longer a dollar as the reserve currency, so no dollar liquidity. When the dollar settles to its relative value (based on the weakness of this economy, and its bloated debt), it will be a highly inflated dollar, relative to the global currency. And the US wil be living in austerity, since it can't issue debt as a reserve currency any more. So social programs - cut. health care - cut. And the bloated defense budget? - CUT!. Only an entity like a global group will have the currency that has trust enough to pay for a defense (army).. If whomever controls the global currency feels like they need an enforcement army to keep order.. Right, I'm trying to figure out gold in this. 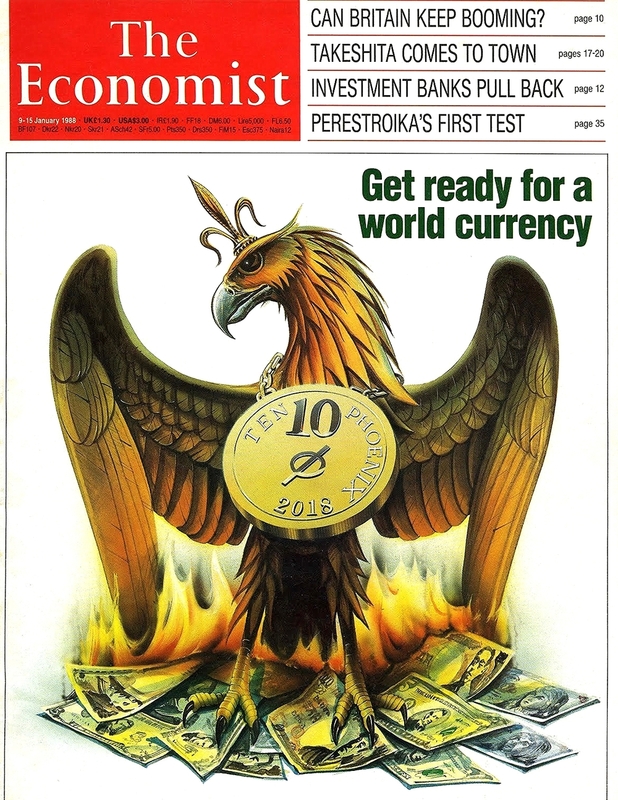 Obviously the magazine shows a gold coin rising out of paper, which makes sense for a new gold backed global currency. I just don't understand, if the central banks are all in collusion, how all the west's gold would have been sent to China. You'd think it would all be more or less equalized between the involved countries. The western bankers are treasonous but I don't htink they would allow the west to be drained of all its gold; surely they know what that would mean in the new currency. From the numbers I've seen it's surprising it's gone on as long as it has. I don't know where all this gold came from, Fort Knox wasn't that big. A global currency, if it were to come about, will be energy based not gold based. Why are we demonising Russia and Iran? Answer: Combined they have the biggest energy reserves in the World. Hence, long term, Russia has a winning hand. Short term they need to survive the US onslaught and not be drawn into conflict. Fortunately the Russian and Iranian leaderships are well aware of the situation. Interestingly, there are signs Germany and Europe may be jumping ship to the Russian side, but it's early days still. I went to a Blues Festival yesterday. The headline performer, Walter Trout's newest alblum was entitled "We Are All In This Together." What I see is a globe that is divided. I live in a country more divided than I recall ever seeing it. It would be nice if we all saw the same picture, agreed on the same solution and ALL rolled up our sleves and got to work, with the same goal in mind. That is not what I see happening. I'm prepared to feed myself, to an extent. I'm prepared to defend myself, to an extent. But I'm not willing to fight to the bitter end, scrambling for what's left. If that's what it devolves to, then I'm probably not going to come out the other side. What would an energy based currency look like? How would they tie it to energy. Just wondering how this would be structured. What's an energy based currency look like? Mark, and interested others. The website Philosophy of Metrics (POM) has been doing a great job of analyzing and presenting evidence on what a new global currency might look like. I have mentioned the site, which has been around for a few years now, in other comments in this site, and think it is worth mentioning again. It has a paywall for some articles in the same fashion that Peak Prosperity does. I also think it is a great complimentary site to PP, especially for additional info about crypto currencies. The site owner seems to have a really good handle on these developments, and his track record for his theories is pretty darn good. I do believe his thinking that we will have a blockchain based SDR in the not too distant future is bang on. And because of this, I also believe the extend and pretend in our financial/economic systems will keep on going ad nauseum, or at least until the energy necessary to power a global blockchain system is no longer available, as in when resource depletion triggers systemic breakdowns. Which of course ties in with everything that PP has been saying all along. I just tend to think now that we will need to actually hit much more serious resource depletion and environmental degradation than what we have now before any kind of big crisis hits. Until then, the slow burn will continue. I did at one point ask the POM site owner to wirite an article to address the limits to growth however he has, as yet, not done so, which is a pity. For those of you who have a deeper need for understanding, I highly recommend his Crown Beast series. To say that it is highly intriguing is an understatement. I must admit I often have to re-read his articles several times to get my head wrapped around them. Ditto for the comments of many of the highly intelligent members who weigh in with their thoughts. Hope those of you who thirst for knowledge find this info useful. Top of my head. The yearly energy production of Nation is calculated and an equivalent amount of currency is created.and shared amongst the population of that Nation. This must include real time energy in the form of food, wood and renewables. For every kWh of energy bought by the people of that Nation, a unit of currency gets destroyed. Food and wood would have to have an energy value assigned to them. Trade between Nations: Nation A is a net energy exporter and Nation B is a net energy importer. Nation A buys a product from Nation B in exchange for currency. Nation B then has the currency to buy energy it needs from Nation A. Regardless of how or why gold has moved from the West to China, it makes sense according to my theory (actually from reading Brandon Smith's blog http://www.alt-market.com/ ), that it makes sense to have one currency among the five IMF's basket of currencies, be able to be partially gold-backed, That's the best way of building trust for the new global currency, when the IMF is coming to the stock market crash to save the day with bailouts in SDR units. After the initial SDR turns into a new cryptocurrency, which is much easier to utilize for a global power group - assuming it's got a back-door, etc. - then China's huan will become the strong currency within the SDR and the US$ will become weakest. Because China has the strongest economy and we have the weakest. They are productive. We are debtors borrowing from the rest of the world, because our currency happens to be the world reserve currency. So China becomes like Germany, and we become like Greece, within the Euro. Except that it's withing the new global currency. So it makes sense that China has the world's gold, in accord with where they will be - the world's strongest economy. Don’t worry we will grow forever! Latest news article about never ending oil supplies. Ralp Nadar interviewers Chris Hedges and Chris talks about his new book. "The authority of the State can never be an end in itself; for, if that were so, any kind of tyranny would be inviolable and sacred. If a government uses the instruments of power in its hands for the purpose of leading a people to ruin, then rebellion is not only the right but also the duty of every individual citizen." "Any renovation which is really beneficial to human progress will always have to begin its constructive work at the level where the last stones of the structure have been laid." "Though I then rebelled against it as too hard a fate, I am grateful that I was thrown into a world of misery and poverty and thus came to know the people for whom I was afterwards to fight." I would either doubt that Hitler wrote that, or assume that it was written before he engaged in activities that cost him and Germany everything. Hitlers quote would be more appropriate if the words “for whom” were removed.